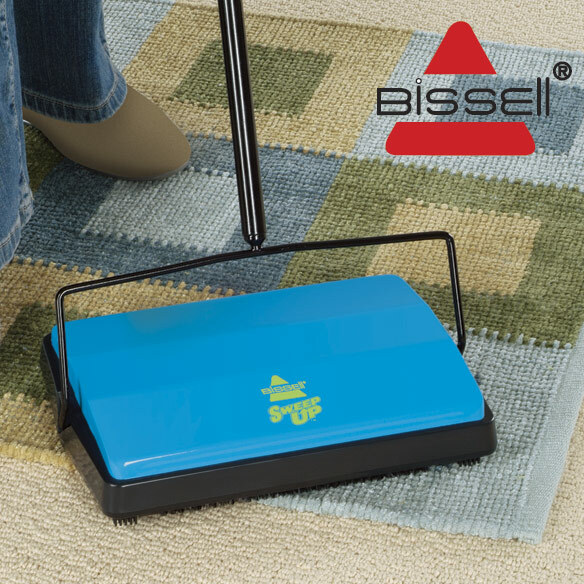 Bissell® carpet sweeper picks up the tiny particles of lint, dirt, crumbs, pet hair. This manual carpet sweeper's slim 11” L x 7 3/4” W design has a 42" swivel handle to reach under furniture and into tight spaces. Bissell® sweeper is quality metal construction with plastic trim and wheels. at the price paid. I have nothing negative to say about the Bissell sweeper. The Bissel sweeper was wonderful for daily messes. Worked well on carpet and hard wood! Like anything with a rotating brush, hair had to be cut out of the brush but it's very easy to empty the trash containers on the bottom. It was so nice to not have to lug out the big vaccuum cleaner everyday. Unfortunately, this sweeper is not rottweiler safe and can be completely destroyed if left alone with a rottweiler overnight. Now, I need to order a new one! LOL! I have had a cat for 5 years. When she gets out of her litter box there is a mat there, but, some fresh litter clings to her feet which gets on the carpet as she walks away. This sweeper is ideal for picking up the pieces of litter that is on the carpet vs. getting out the Big Sweeper. I had one before which was given to me by a friend but it wore out so I ordered a new one. Always had one years ago and knew they work well. Good for daily pick-up. It beats getting the regular sweep out. Easy to use and very convenient! Lightweight, easy to use and clean. Great for quick pick ups!! Mine is used daily by various folks at work as our boss hates to hear a vacuum cleaner. So when he is there, and someone has a mess to clean up..they use it. There can be as many as 5 folks a day using it. We are on indoor carpet and make jewelry..so yep we all love it. It is also cleaned out daily because so many do use it. I have to cut the hair and the carpet out and remove it from the rollers from time to time as normal maintains.It has been an AWESOME cleaner. And IF it ever gets broken..you can bet I will buy another one ASAP!! The product is excellent, and Walter drake handeled all of the other details very well, Thank you! I have two small dogs and there is always hair on my throw rugs and even in my lint catcher in my dryer.....I paid 10.00 less for this and I use it every day, when I empty it I end up with two big clumps of dog hair and a little bit of sand. I had one when I lived in the country but when I down-sized I gave it away because I moved into a very small cottage. Well I moved into something bigger and ordered another one of these, CAN't do without it!!!!!!!!!!! I HAVE A COCKATIEL WHO IS ADORABLE BUT VERY MESSY. BEFORE I GOT MY BISSELL I HAD TO TAKE MY VACUUM OUT DAILY AND THAT WAS A BIG PAIN IN THE NECK. NOW, I USE MY BISSELL SEVERAL TIMES A DAY AND LOVE IT. I ORDERED THREE MORE RECENTLY, ONE I GAVE TO MY NEIGHBOR'S DAUGHTER AND I'M SURE SHE NOW ENJOYS TAKING CARE OF HER ROOM AND THE TWO OTHERS WILL GO TO MY GRANDDAUGHTERS WHEN I SEE THEM ON EASTER. HAPPY HOLIDAYS TO ALL! Perfect for in between vacuuming. Works well on carpet and hard surfaces. This works better than my dust buster and makes no noise. This is just as good if not better than years ago. My 85 yr old father uses this sweeper. He has memory problems. Right out of the box, he knew what to do with this sweeper. He did not hesitate in any way with this sweeper. I like to sweep the carpet after our Chihuahua eats pretzels, or his meals (he is a messy eater). This was exactly what I wanted. It is very light weigh! It is very light weight which is very perfect because of my age. I had my earlier one for about 10-12 years and decided I desreved a new one to go with my new home. Fortunately, the new model is just as useful and handy as the former one. I especially like it because it does such a good job without having to push hard or go over and over the same place. Great product.....just what I needed! With having two beagles who shed I needed something that would pick up hair fast and easy. This does the trick....easy to get out of the closet three times a day to pick up hair. I love it! Easy to use. Great at picking up pesky pine needles! I love it. It's a great. In between using the heavy sweeper. you do this everytime you use it, it works great. Good on hard wood floors as it is on throw rugs. Really good for a fast cleaning ! The convenience is the best feature of this carpet cleaner. No electical cords. I just wish it could clean the uncarpeted or wood floors as well. Keep it handy in the kitchen to clean up "crumby" messes. I really like this for my office. It's quiet so I can still clean without disrupting clients. It works fairly well, gets most of the big stuff up and helps things look a lot cleaner. I would reccomend this to others. Sweeps rugs, carpets, wooden floors very well. Great when you don't feel like using the vaccuum. This is cheap plastic junk. The first time I tried to use it, the gears all came apart. Walter Drake said to not even try and send it back, just throw it away. ONCE AGAIN, FELL APART FIRST TIME USING IT!!!!! SHOULD HAVE PURCHASED A FULLER BRUSH PRODUCT INSTEAD!!!!! I WILL PURCHASE A FULLER BRUSH ELECTROSTATIC SWEEPER FROM ANOTHER VENDOR!!!!! Went to use it for the first time.I did one room and the bottom roller fell out .Trying to fix it, all the dirt fell on the carpet.This item shouldn't be more than 10 dollars.Cheaply made. Brush bar fell off with original purchase; received a replacement and the same thing happened. I requested my money back. Don't waste your money on this!